There were no officials from Major League Baseball at Borders in downtown Boston today waiting for Jose Canseco. 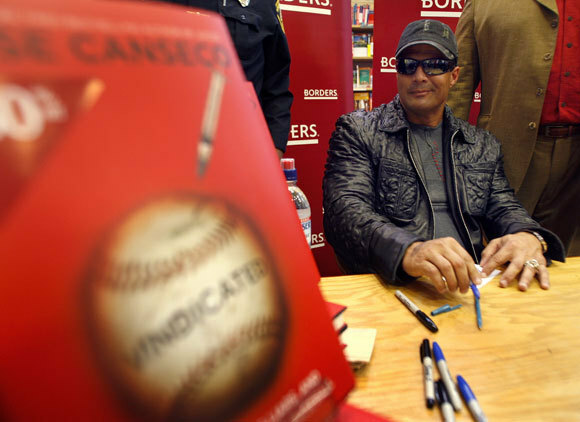 Just nearly 150 people, clutching red hardcover copies of Cansecos latest steroid tome, Vindicated, already at 30 percent off, as the former Red Sox slugger and admitted steroid user sat calmly in the Travel section and autographed books. That was in marked contrast to yesterday, when MLB investigators approached Canseco for information on the steroid scandal that has plagued baseball since the 1990s, the first time baseball officials have asked Canseco for his assistance in the investigations. Canseco is still willing to help. Once his book tour, which is scheduled to run through next week, is finished, he and his attorney, Robert Saunooke, will meet with MLB officials. Saunooke accompanied Canseco to the book signing in Boston, along with Cansecos girlfriend/publicist, Heidi Northcott. Canseco again alleged that about 80 percent of baseball players were using steroids when he was in the majors, from 1985-2001, though he thinks the percentage is very small now. In Cansecos first book, Juiced, many of the allegations were corroborated when the Mitchell Report was released in December. In between expressing feelings of surprise and vindication, Canseco offered one last quip, something that should be music to the ears of one former member of the Red Sox.